You wouldn't expect A Place to Bury Strangers to headline a family-friendly event like Wavelength's ALL CAPS! The New York-based power trio's impossibly loud shoegazer rock left adult ears ringing at the festival's final concert Sunday night, yet there were still a few rugrats walking around with protective earmuffs. The band opened with "Ocean," the last track on their first album, and continued with a set list that drew from all three of their records. Smoke machines and lasers gave the show mystique, as the band cranked out post-punk songs obscured with thick layers of effects. 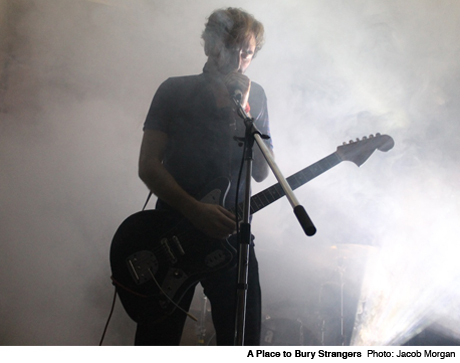 What made A Place to Bury Strangers great was their ability to rein control over their noise. At one point, guitarist and vocalist Oliver Ackermann writhed on the floor as climactic feedback filled the fireplace room. Towards the end, Ackermann picked up a strobe light and pointed it at the audience before everything went pitch dark. The lights came back on, and he returned carrying his guitar over his head like a tool for chaos, and then exited the stage leaving the instrument on a toppled Marshall stack. Booking A Place to Bury Strangers was a sign of ALL CAPS! 's growing stature, but it would have been nice if the last concert had been outdoors. Still, the group's sheer volume was cathartic and invigorating, and as people ran to catch the last ferry leaving the island, there was palpable excitement in the air.